Overview - The ‘80s coming of age cult-classic makes its highly anticipated hi-def debut with the Blu-ray release of BETTER OFF DEAD. Starring John Cusack as the awkward, teen Lane Meyers, the romantic dark comedy follows Lane after his girlfriend dumps him for a more popular guy. After many unsuccessful attempts to win her back, he decides that suicide is the only answer until he befriends a beautiful foreign exchange student who helps him turn his life around. 'Better Off Dead,' a favorite 1980s teen comedy, is not an entirely well-made movie. It often feels somewhat unfocused, choppy, and randomly slapped together. Some characters can be a bit uninteresting and seem to lack motivation while first-time director Savage Steve Holland delivers a very workmanlike pace. I can admit the movie has issues worth considering for first-time viewers and part of my enjoyment is very likely due to nostalgia. But like the script's main character, the film's various drawbacks are compensated with a charming and wittily amusing personality. It's a quirky, offbeat look at the pressures of being a teenager in love. Holland seems to be a fan of this particular subject given his career in Hollywood centering almost exclusively on topics which interest most teens. Whether it's the big screen or the small screen, live-action or animated, the writer and director of many Nickelodeon programs loves to make the life of modern kids appear more exciting than they really are. 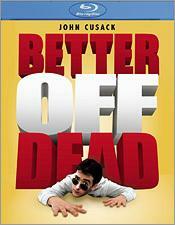 In 'Better Off Dead,' he succeeds more often than not in a story about being dumped by the girl of your dreams. Even worse, to be later replaced by the most popular kid in school, the rich, athletic captain of the ski team. It's an easy, by-the-numbers formula where Holland only has to input his own eccentric twist to make it worth watching. In making this the perfect star vehicle for John Cusack, Holland is able to establish the ideal tone that attracts young viewers without having to throw in any of the gratuitous raunchiness popular in most comedies of the mid-80s. Cusack's portrayal of Lane is a wonderful blend of a miserably heartbroken kid that secretly harbors a wildly imaginative goofball. He carries the entire picture's spirit and energy on his shoulders, and the movie's enduring popularity is pretty much all because of his making the character easily relatable. Along with 'The Sure Thing,' which released the same year, Cusack demonstrated he was destined for stardom as a leading man. After being dumped by Beth (Amanda Wyss), Lane retreats to his own little world with thoughts of ending it all. From other students being better prepared for Math class to his dreaming of creating a Frankenstein burger, the oddball comedy is often from his point of view as he struggles to find new meaning in his life. A good chunk of the jokes come from these seemingly tangential daydreams, where audiences are left clueless as to what is imagined and what is real. Holland's best work comes from such funny sequences and other screwball gags, like the paperboy demanding his two dollars. It's in these moments that he's able to capture the hysterical awkwardness of adolescence and make it work as a clever spoof of other teen movies. His parents (Kim Darby & David Ogden Stiers), one too intent on learning how to cook and the other trying too hard to relate, don't seem to give him enough space, while his little brother (Demian Slade) is ignored to success. His best friend (Curtis Armstrong) tries to lend an encouraging hand although in his own bizarre, rather morbid way. But it's the lovely French exchange-student (Diane Franklin) from across the street that finally shows Lane how to move on and rediscover love. 'Better Off Dead' may not be perfect, but with an absurd sense of humor on teen angst, it's a fun and memorable 80s comedy that continues to deliver the laughs. Paramount Home Entertainment brings the favorite 80s teen comedy to Blu-ray on a Region A locked, BD25 disc inside a blue eco case. As seen in previous Paramount releases, the cover art is hideous and better off replaced. At startup, viewers are taken to the main menu with music and full-motion clips. 'Better Off Dead' arrives with a great VC-1 encoded transfer (1.78:1). Primaries shine with brilliance and energy, really giving off that animated quality expected of any fun comedy. Secondary pastel hues are also bold and full of life, radiating with that 80s cringe-worthy cheese so many remember. A thin veil of grain is ever present and consistent throughout, affording the picture with a terrific film-like quality. Contrast is spot-on with crisp whites while black levels are generally strong and deep, providing the image with good dimensionality and shadow delineation. Clarity and definition are far better than could have been expected with perfect visibility of all background information. Fine lines and textures are very well-detailed and distinct, especially during close-ups, allowing viewers the excellent advantage to gawk at some of the great outfits and hairstyles of the era. If not for a few soft spots and one or two scenes with poorer than average resolution, all of which are understandable given the film's age, this high-def presentation of a John Cusack classic would very easily rank higher. Nevertheless, this is the best the movie has ever looked, a true winner in this fan's book. On the audio front, things keep looking good with this satisfying DTS-HD Master Audio soundtrack. Keeping in mind that the original design was already somewhat limited to begin with, the track is quite nice, with plenty of warmth and strong fidelity. All the action is front-heavy with very little activity in the background and nothing going on in the rear speakers. In spite of this, the lossless mix serves the movie well with crystal clear dialogue and a fine sense of presence. At times, it can seem somewhat narrow and limited to the center of the screen, but when the music and song selections kick in, the soundstage noticeably widens with a well-defined mid-range and a healthy low-end. It may not blow your socks off, but 'Better Off Dead' is pretty much what one would expect from a good stereo presentation. The only special feature is the original Theatrical Trailer. Despite some rough patches, which are relatively minor, 'Better Off Dead' delivers a funny, offbeat look at love during adolescence. With a likeable and memorable performance by a very young John Cusack, the 80s teen comedy remains a cult favorite of the decade, full of clever, witty gags. The Blu-ray comes with a good video presentation and strong audio, but Paramount sadly offers nothing in the bonus collection. The overall package is a decent upgrade for devoted fans, others would be better off renting.